HP printers were always known for their universality. They were excellent home/office solutions when it was needed to print out text, graphics and probably text with photos. However, they were less photo-realistic than 6-color rivals. 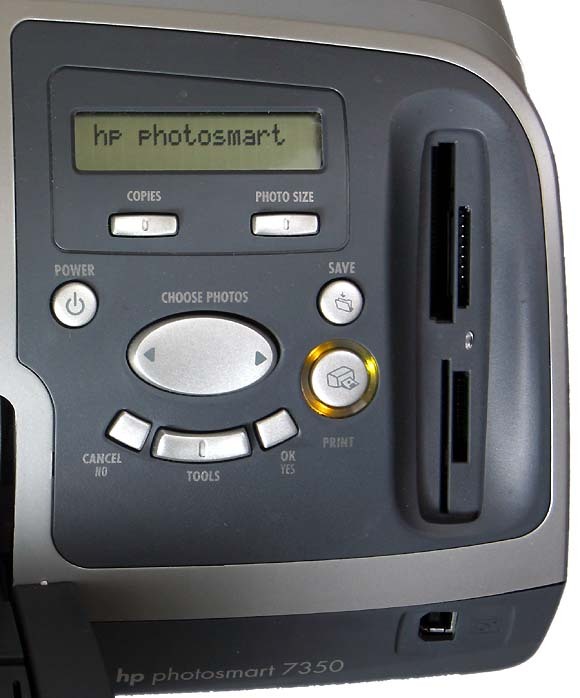 The new models of HP printers are even more universal because they can turn into photo-realistic ones by changing a black cartridge with a photo one; a USB connector which allows attaching directly digital cameras HP, and 4 memory card slots (CompactFlash I and II, SmartMedia, Secure Digital, MultiMedia Cards and Sony Memory Stick) provide widest functions even without a computer. You don't need to calibrate the printer yourself, because it prints a test page, scans it, and adjusts the printing heads to match the lines printed in different colors. 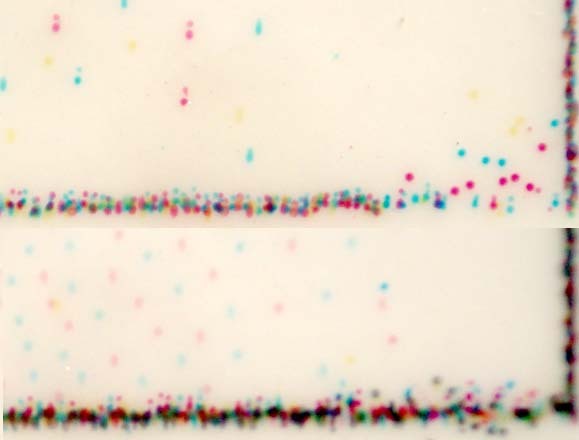 Moreover, you don't need to know about paper properties as the printer defines its type by dispersion of light from the surface. However, you have to spend time on studying the controls. Below is the control panel with connectors for memory cards and a USB one for a photo camera. Sometimes you might need to fish out paper, for which there is a removable cover on the back. You can replace it with a feeder at extra cost for double-sided printing. The back incorporates two connectors: USB for connection to a computer and one for an external power supply unit. Such a universal printer is able to cope with 90% of printing tasks, but it can't manage even a half of problems which may occur in photo printing. You can print out photos of any format fitting in A4, and even photos up to 35 cm long. But the competitors have no limits in length at all. The paper choice is rich. But if you need to use art paper or some paper types from other manufacturers, in particular, 21x35 cm which is not produced by HP, the problems can be really difficult to solve. The recommended option "Other Photo Papers" makes a hint that strangers are not welcome. A role of paper in photography is very important. In the classical case a photographer always has a dozen of paper types different in contrast, tint, texture, thickness etc. If the problem of contrast can now be solved with the help of a computer, the other requirements remain unvaried. Creativity can't be bound, and a set of photopapers from HP doesn't make even a tenth part of existing materials for ink-jet printing. Usage of arbitrary papers requires rich settings, but this is not the case of this printer. You can just make an image warmer or cooler. 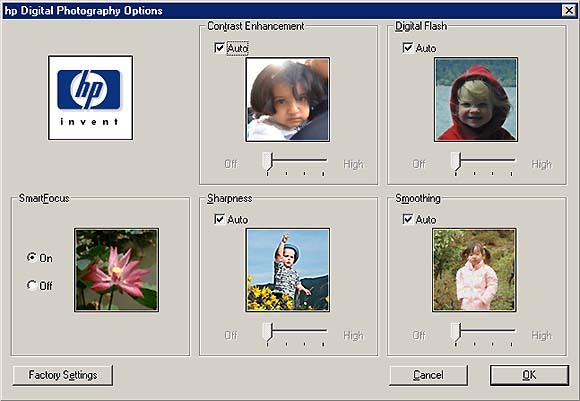 These capabilities are not enough even for HP's paper samples, not to mention an arbitrary paper type. Here is an example. The magenta color absorbs a green component of the white color. But by adding this dye we can make shadows on green leaves. At the standard settings on the Premium paper it's quite possible that the forest consists of just trunks because a part of the crown will turn into magenta instead of dark green. The balance between cold and warm tones adjusts the blue/yellow correlation. But this doesn't help to solve the problem of surplus magenta. However, there is a solution demonstrated on a CD supplied. The demo photo shows a green lawn, and the solution is coded in the file name, - the file is saved in the CMYK format instead of RGB. That is why for correct delivery of shadows you must convert the RGB space into CMYK. This is a real surprise as CMYK is native neither for photo cameras this printer is meant for, nor for this very printer as it uses 6 colors instead of 4, i.e. beside Cyan C, Magenta M, Yellow Y and blacK K it has light cyan and light magenta. The surplus magenta can be noticed mostly only on the Premium papers. Probably, they thus make printouts more durable as magenta fades out first. This effect is inconsiderable on ordinary photopapers. The printer demonstrates quite good color transfer on Folex films which are meant for the old 500 series of the HP printers. It's a paradox but the color transfer in 4 colors is more natural, and advantages of 6 colors tell only upon the raster size when delivering light tones. It's well seen on printouts of gradient filling implemented with the means of vector graphics. 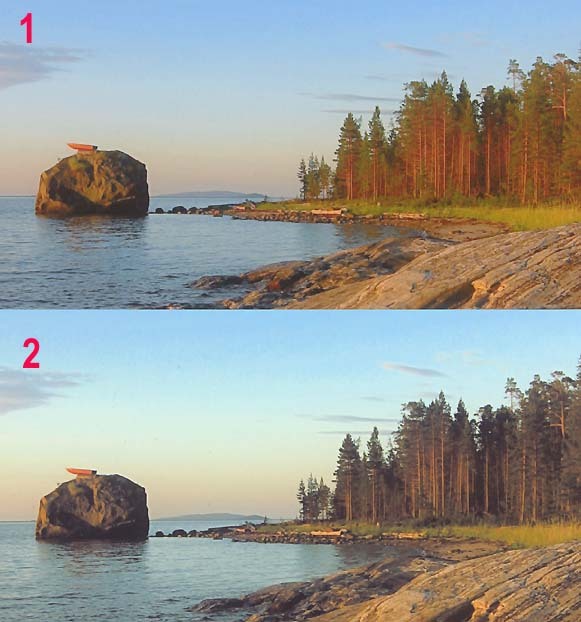 By changing the settings you can improve bad photos. You can alter contrast, make details clearer in shadows (DigitalFlash mode), adjust sharpness of edges ("SmartFocus", "Sharpness", "Smoothing" modes). To get into the photorealistic mode you must replace the black cartridge with a tri-color one with light cyan, light magenta and black inks. A special support is provided to prevent removed cartridges from drying up. 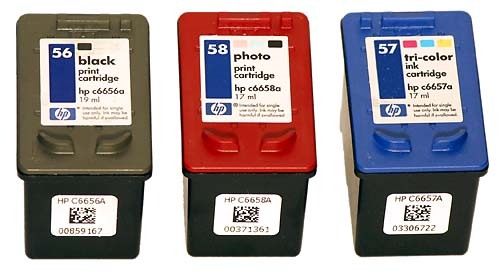 Cartridges are enough for about 25 photos of the A4 of the top quality. The printer will do its best to complete a task and won't refer to all possible reasons. 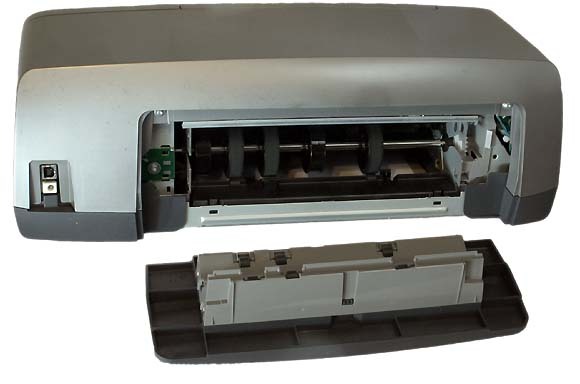 If one of the cartridges gets empty, the printer is able to finish printing with the remaining one. The quality won't be optimal, but you will be able to finish the task somehow. Below are the ways of printing depending on quality fixed in the driver, and the respective printing speed. The fastest mode, FastDraft, gives inferior quality, though it's legible enough. 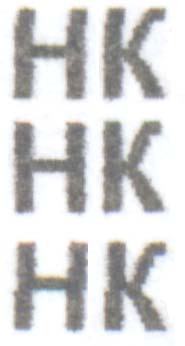 Scanned in 1200 dpi; in the parentheses comes the time of printing of one text page. 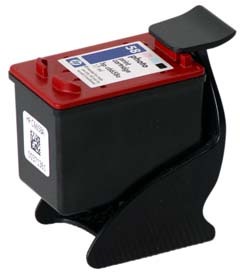 The printer allows making additional delays to let the inks dry up. Beside the overall blurring effect, which is quite natural, some letters look like italics. The shift arises from time to time in some lines, and the point of shift changes all the time. The new printer has a much wider area of application. 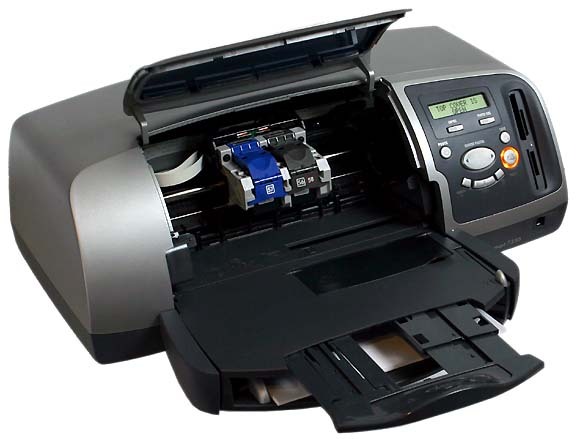 It can be used both for typical secretary work and for printing photos and reading memory cards. If you need a printer for making illustrations in a book, this one is a good choice, but its capabilities are not exhaustive for printing out separate photos not framed by text. You can produce photos but only for some, quite narrow frames. It's possible to improve bad shots, but it's too hard to deliver ideally good images.